Under $2.00 per serving. Serve this zesty slow cooker chicken flavored with tomatoes and just the right amount of herbs over spaghetti to enjoy all the flavorful sauce. 1. Place chicken and mushrooms in slow cooker. 2. Mix Seasoning, tomatoes and tomato paste until blended. Pour over chicken and mushrooms. Cover. 3. Cook 8 hours on LOW or 4 hours on HIGH. Remove chicken and vegetables to serving platter. Stir sauce before serving. 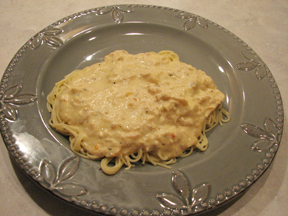 Serve over hot cooked pasta, if desired. Test Kitchen Tip: Remove skin from chicken parts, if desired. Use a paper towel to grasp the chicken skin for easier removal.